Shri Piyush Goyal, Hon’ble Railway Minister laid the Foundation Stone for the 36 km long Dharmapuri – Morappur New Railway Line at a function in Dharmapuri (Vallalar Grounds) today (Monday, 4th March 2019), the Hon’ble Railway Minister also participated in a function at Chennai Egmore through Video Conference and announced the Extension of Train No.16191/16192 Tambaram – Tirunelveli Antyodaya to Nagercoil and also flagged off Train No.16101/16102 Chennai Egmore – Kollam Daily Express in the presence of Shri K.P.Anbalagan, Hon’ble Tamil Nadu Minister for Higher Education, Thiru P.Thangamani, Hon’ble Tamil Nadu Minister for Power, Dr Anbumani Ramadoss, M.P. Shri R.K.Kulshrestha, General Manager, Southern Railway and Shri A.K.Singh, General Manager, South Western Railway, Shri U.Subba Rao, Divisional Railway Manager, Salem, Shri R.S.Saxena, Divisional Railway Manager, Bangalore and other invitees participated at Dharmapuri. the function held at Chennai Egmore, Shri D.Jayakumar, Hon’ble Tamil Nadu Minister for Fisheries, Personnel &Administrative Reforms, Shri K.N.Ramachandran, MP, Shri A.Navaneethakrishnan, MP, Shri TKS Elangovan MP, and Shri P.K.Mishra, Additional General Manager, Southern Railway, Shri Naveen Gulati, Divisional Railway Manager, and other officials, staff and passengers were participated at Chennai Egmore function. Hon’ble Railway Minster in his keynote address expressed happiness and thanked both the Tamil Nadu Ministers for the warm welcome extended by the people of Dharmapuri.He said o­n this auspicious Shivarathri day he will pray for the happiness and prosperity of the people. He said that the brave solider Mr. Abhinandan made all Indians proud, particularly the people of Tamil Nadu and added that India will give a fitting reply to terrorists and terrorism. Highlighting the aspects of Railways, he said that ICF has made a mark with its modern trains under Make in India campaign, making the country proud. He said that the era of importing will be over soon and the exporting will start. He said that that new line between Dharmapuri and Morappur will be commenced immediately and completed at the earliest. And he also announced that the Hosur – Bangalore section Doubling with Electrification has been sanctioned and connected to Salem via Dharmapuri, that the Chennai - Palakkad Super Fast express Train No 22651-22652 will be stopped at Morappur considering the request of people of Dharmapuri. He said that India is in Safe hands and progressing under the able guidance of the Hon’ble Prime Minister. The Government’s mission to provide home, sanitation, electricity and good health to all. The Kisan Yojana has started and now Pradhan Mantri Shram Yogi Mandhan Yojana will be launched tomorrow for the benefit of workers, he said. Dr. Anbu Mani Ramadoss while welcoming Hon’ble Minister to Dharmapuri stated that, this is a historic Project which was restored after 78 years and which will benefit Dharmapuri District Economically and Socially. He also thanked the Honble Railway Minister for sanctioning the project and for providing stoppage for train No 16381/82 Kanniyakumari – Mumbai CSMT at Bommidi Railway Station . தேங்கிய தண்ணீரை வெளியேற்ற 2 டீசல் என்ஜின்கள் வழங்கப்பட்டுள்ளன. அதை பராமரிக்க வேண்டியது உள்ளாட்சி நிர்வாகத்தின் பொறுப்பாகும்.அந்த்யோதயா பயணிகள் ரயில் சிதம்பரத்தில் நின்று செல்ல திருச்சி கோட்டம் மூலமாக நடவடிக்கை எடுத்துள்ளோம். அந்த ரயில் கடலூரில் நின்று செல்லவும் நடவடிக்கை எடுக்கப்படும் என்றார் அவர். Southern Railway has made the following changes in train services on Saturday due to line block in connection with elimination of unmanned level crossings with Limited Use Subway between Vanchi Maniyachchi – Naraikinar in the Vanchi Maniyachchi – Tirunelveli section. Train No.56769 Palakkad – Tiruchendur passenger train will be partially cancelled between Virudhunagar – Tirunelveli. Train No.56770 Tiruchendur – Palakkad passenger train will be partially cancelled between Tirunelveli – Virudhunagar. Tiruchchirappalli at 10.20 p.m. or late by 135 minutes. Train No.56708 Madurai – Dindigul passenger train will arrive Dindigul at 8.15 p.m. or late by 30 minutes. Train No.56320 Coimbatore – Nagercoil passenger will reach Tirunelveli at 7.10 hrs. or late by 45 minutes. Train No.56825 Erode – Tirunelveli passenger will arrive Tirunelveli at 11.20 p.m. or late by 40 minutes. Train No.16192 Tirunelveli – Tambaram express will reach Tiruchchirappalli at 11.40 hrs. or late by 45 minutes. Train No.12638 Madurai – Chennai Egmore Pandyan express will reach Tiruchchirppalli at 11.30 p.m. or late by 15 minutes. Train No.02193 Tirunelveli – Jabalpur weekly express will reach Tiruchchirappalli at 12.35 a.m. or late by 140 minutes. 10. Train No.56768 Tiruchendur – Tuticorin passenger will have no connection to Train No.16235 Tuticorin – Mysore express at Vanchi Maniyachchi and will arrive Tuticorin at 7 p.m. or late by 30 minutes. 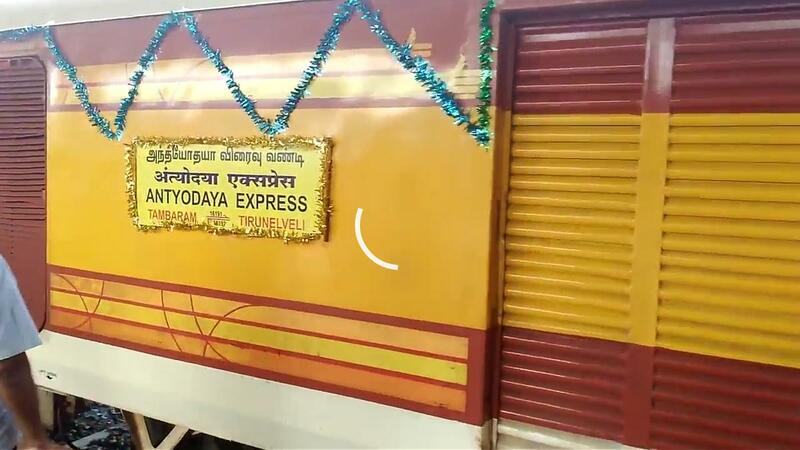 Recently, the Union Minister of State for Railways Rajen Gohain flagged off an Antyodaya Express train service for unreserved passengers, which will ply on the Tambaram-Tirunelveli route in the Southern state of Tamil Nadu. The train number 16191 will depart from Tambaram railway station at 12:30 AM and will reach Tirunelveli railway station at 3:30 PM. On the return journey, train number 16192 will depart from Tirunelveli railway station at 5:30 PM and will reach Tambaram railway station at 9:45 AM. 2) En route, train number 16191/16192 Antyodaya Express train travelling between Tambaram and Tirunelveli will halt at 9 railway stations namely, Chengalpattu Junction station, Villupuram Junction station, Mayiladuturai Junction station, Kumbakonam station, Thanjavur Junction station, Tiruchchirappalli Junction station, Dindigul Junction station, Madurai Junction station and Virudunagar Junction station. 3) For a much better look, the interior panelling of the coaches in train number 16191/16192 Tambaram-Tirunelveli Antyodaya Express train has been done with aluminium composite panels, which are similar to Deen Dayalu coaches of Indian Railways. 4) The Tambaram-Tirunelveli Antyodaya Express train has also been provided with many modern facilities such as bio-toilets, water purifiers, mobile as well as laptop charging points, cushioned luggage racks with coat hooks, LED lights, fire extinguishers with an anti-theft arrangement and enhanced capacity dustbins. 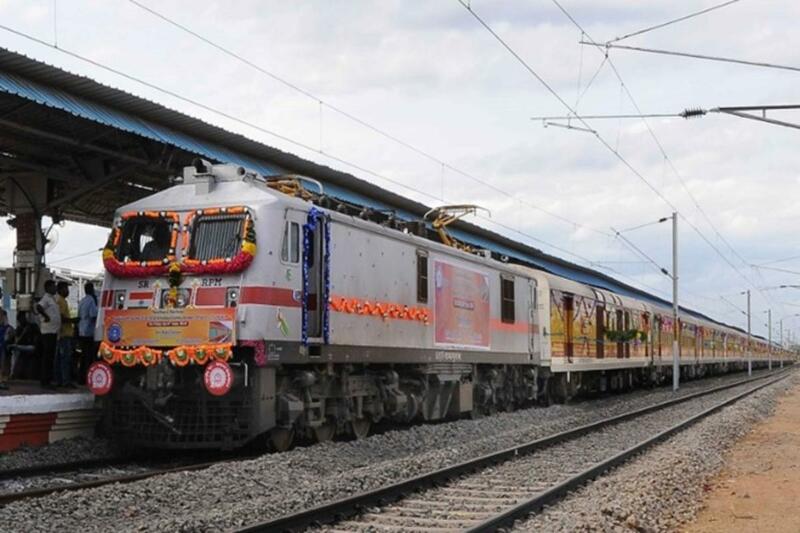 5) Interestingly, the Tambaram-Tirunelveli Antyodaya Express train is the first Antyodaya service from Tamil Nadu. The train will be a boon for passengers who frequently travel between Chennai and southern districts of Tamil Nadu and also to them who travel on short notice and during peak seasons/festivals. Copyright ©	The Indian Express [P] Ltd. All Rights Reserved.